The outside of the cheek, bentside and tail are decorated with paintings of putti or cupids engaged in various amorous pursuits which, collectively, might be called The Triumph of Love. 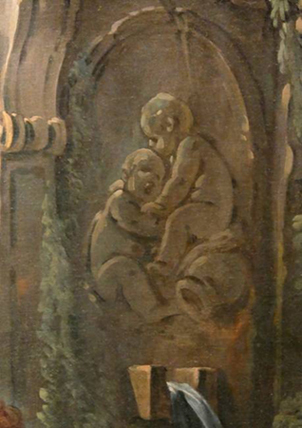 Here a monochrome cartouche shows two putti having a quick snog in the darkness. Other scenes show similar figures engaged, sharpening their arrows, getting some target practice and, finally, returning from the hunt with their chosen victim pulled along in a chariot. The photograph above shows a mirror reversal of the grey monochrome detail in Boucher’s Autumn Pastoral (No. P482) in the Wallace Collection, London. These two are clearly inspired by the same author and this is one of the many indications that the figure paintings on the Franco-Flemish harpsichord are by François Boucher.